There’s an art to using color in the garden so that it sparkles and sings. Color is, of course, one of the major features that draws us to a garden, but preferences are very personal. Some gardeners love hot colors – including orange – others can’t abide them, taking pleasure only in soft pastels. 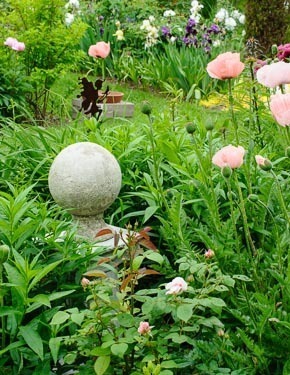 In a small garden, you could restrict yourself to limited colors to avoid clashes. But if you have more space, you can try different color schemes in different parts of the garden, or different times of the season. After all, color is a great way to get adventurous in the garden. Why do so many gardeners hate orange? Hot color adds excitement: Colors such as red, orange and yellow are considered hot, and they also stand out best during the hottest summer months.Cooler pastel tones can look faded in bright sunshine. Avoid a riot of color: If you use every flower color in the book, you’ll just give yourself a visual migraine. This isn’t just a matter of taste: according to color experts, the human brain, has an innate dislike of too many contrasts all at once. Pastels soothe: For subtle, relaxing effects, stick to cooler pastel shades – mauve, pink, white and shades of blue and, of course, the green and other colors that come with foliage. This is particularly effective in small gardens. Contrasts – in moderation – add spark: Use contrasting color in the garden for bold, eye-catching effects – blue and yellow, orange and purple, red and white. You won’t want to overdo this because too much contrast is jarring to the eye (see the above point). Enjoy the best of both worlds: Use the subtle and the bold by varying your color scheme with the season. For example, spring and early summer color might be a pastel with tulips in white and pink along with pale yellow and white daffodils, leading to pink peonies paired with Siberian irises blooming in mauve and blue. Then, come the heat of summer, your color scheme can switch to bold by pairing tawny orange and mahogany Helenium, pink Echinacea and chrome yellow black-eyed-Susan. 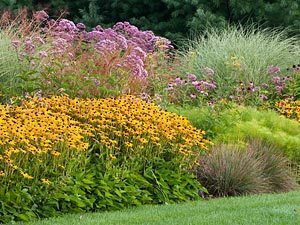 Because the bloom times of the first and the second group of perennials are different, you’ll avoid color clashes. Single color gardens: Garden designers love single color gardens, which have the undeniable appeal of sophistication. Besides discipline, the secret to success with monochromatic schemes is using the particular color you’ve chosen in its varying shades, from pale and pastel to dark and rich – and playing leaf textures and colors off against each other as well. White garden caution: White flowers can be difficult to incorporate, as white can make other colors pale in comparison or stick out too much. But white also glows in the evening, which is great if you like to sit out in the garden after dinner. In a white garden, you need to be meticulous with deadheading, because faded brown petals stick out among pristine flowers. Color in the garden – helpful hint: Here’s a neat trick for solving clashes of color in the garden – pick the problem flower and hold it up to the other flowers to see if you cant find a better match. If it’s mid-summer, don’t move your plants right then – they will sulk or worse. Just pick the flowers you don’t want in the garden, and put them in a vase, and make a note to do the transplanting job in spring or fall.